I have been trying to implement a service that will be scheduled on certain periods of time, for example when users selects an action in application, service should be scheduled to run every five minutes for one hour processing some data (read some data from specified url and store that information into local database). After one hour has passed service should stop and can be scheduled again by the user. . To implement something like this there are several challenges and it took me some time to figure out how I should implement this following Android best practices. In this article I am going to explain how I believe something like this should be implemented and you are all welcomed to leave your comments regarding the solution. Let me start first with one small diagram that explains how this solution should work. If you look at the diagram above you shall see that whole process starts with users initiating it trough some action. This action should be specifying url address and hitting button to start. This button action will trigger url to be written down for example in database together with value of current time plus one hour and than at last schedule alarm manager to notify Alarm Broadcast receiver in 5 minutes starting from now. 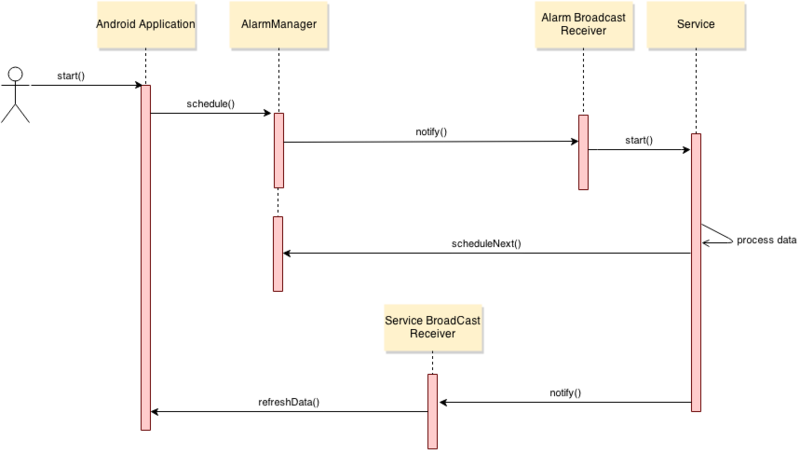 Also one more note there is another broadcast receiver (Service Broadcast Receiver) registered with application dedicated to receive notifications from the service in case application is in focus so that it can fetch data from database processed and written int database by the service. Coming back to the moment when alarm manager triggers notification, Alarm Broadcast Receiver gets notification and starts service so that it can do it’s job. Looking at the service and its execution, once started by receiver, service first takes url and end time from database, fetches data from url and writes it into database. Next step it checks if end time has passed, in case it has not passed creates new schedule for alarm manager so that it can be woken up in 5 minutes starting from now, in case end time has passed there is no schedule to be created against alarm manager and service will not run again until users starts process again. In both cases last step in one run of a service is to send notification to Service Broadcast Receiver so that application can be updated. One more thing to add here regarding the service is that we need to make sure mentioned service can be interrupted by CPU going to sleep. This can mean that data can be left inconsistent and we can not guarantee that service will be executed every 5 minutes. How to take care of this situation will be explained in the code of Alarm Broadcast Receiver and Service itself. Now that we have this process defined, let’s start with looking at code how this can be implemented. First look at the layout of the application interface (app_layout.xml), simple and clean, it has one input text box for url and a button. android:text="Enter url to read data"
As you can see class AlarmBroadcastReceiver extends WakefulBroadcastReceiver class, this class ensures that receiver receives event from Alarm Manager and starts Service . Also holds wake lock when service starts and passes intent with method startWakefulService that has extra that represents wake lock. This way Service is able to release wake lock once it does it’s job. For details take a look at WakefulBroadcastReceiver. With this manifest solution is complete and also this small tutorial, please leave your comments in case you notice any problem in the solution. There might be some minor issues in the code since it is taken from project of mine and some parts I have removed in order to simplify the code for this tutorial. Nice Android Articles. Thanks for sharing your research which are helpful to others. It would be excellent if you can share the code somewhere like Github. Thanks Raghu, I shall try to put code on Github soon.